With its lightweight aluminum base and mesh top, this cafe table is versatile and virtually maintenance-free yet crafted to endure in every type of outdoor weather. 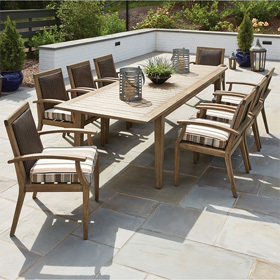 Plus, it sports a casually classic look, which means coordinating the table in a variety of patio and backyard settings will be a breeze. Additionally, the table is equipped with a convenient umbrella hole for adding a source of shade during outdoor meals. 30"L x 30"W x 29"H 12.3 lbs.